Rains for the past couple of days prior to that, had made matters worse, not just for the residents of this region to come out of their houses and finish their last minute shopping spree, the puja organizers too had a tough time to put up a good show. The prayers must have been answered as the whole of Barak valley woke up on a foggy Monday morning to greet Goddess Durga on ‘Sasthi’. Rains for the past couple of days prior to that, had made matters worse, not just for the residents of this region to come out of their houses and finish their last minute shopping spree, the puja organizers too had a tough time to put up a good show. Nonetheless, with weather clearing up, at break neck speed many pandals of Silchar, the main hub of this region and Assam’s second biggest township after Guwahati, spruced up their respective pandals. Some are yet to finish their task, but, are upbeat to put up a show for all pandal hoppers to remember for a long time, believes, Piklu Das, secretary of one of the pandals in Silchar. Those who have finished are ready to open their pandals for people to come and have a look of what they have made. Pratham Pally Club of Tarapur, which is celebrating its 51st year, invited Swami Tithyananda Maharaj of Ramakrishna Mission of Silchar to inaugurate it. Swami ji too paying his obeisance to Goddess Durga, flagged off the next four days of Durga Puja festivities for Pratham Pally club. “We are inviting all residents of the three districts of Barak valley to come and have a look out here. We were really worried and finding it tough to finish the task, but, by the grace of Goddess Durga and her blessings, the weather has cleared up for us to finish our task. 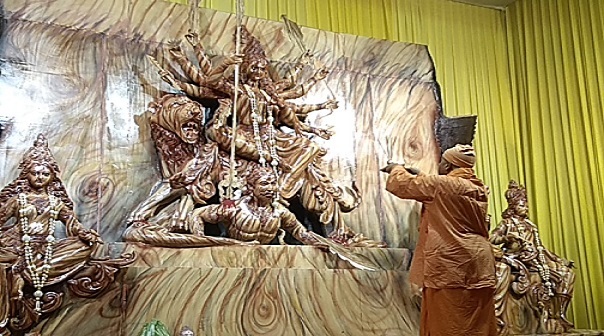 The idol of Goddess Durga has been made by artisans from Kolkata, while, lighting and pandal decoration has been done by localites of Silchar,” Sujit Kumar Deb, secretary of Pratham Pally Durga Puja Committee said. 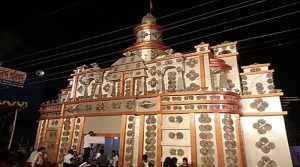 Not to wait for any other day, the whole of Silchar town was jam packed on Monday evening itself and witnessed people hop from one pandal to the other. “I have decided to take all the senior citizens of our household for showing them some of the pandals in and around Silchar, today itself, but, never thought that it would take more than two hours to just traverse two kilometres,” Dolon Chapa Bhattacharjee, a resident of Shyama Prasad Road of Silchar said.